Sunday was a glorious day here in California. It was finally warm out, the sun was shining and I feel so energized. Last week I kind fell off the nutrition and exercise wagon so this week, I am starting fresh and new. Sunday I woke up had my cup of java and then did 30 minutes of strength training, than I decided to walk to the store and pick up some groceries. I carried the basket with me so I wouldn’t overload my bags, but I kind of did. It was only 3/4’s of a mile home, but my arms were killing me. Than in the afternoon I was craving an ice coffee, so off for my second walk to Starbucks and of course Hubby asked if I could pick him one up. Fine I said, but I’ll tell you I hate carrying hot coffee, it makes for a long walk, especially when it splashes on your hand and there’s nothing I can do about it. So today I have an awesome and I mean awesome pancake recipe for you. These pancakes were unbelievably good!! So good that I might make a quick batch before work tomorrow. Yup there worth getting up 10 minutes earlier on a Monday, there that good! They are Banana Nut pancakes. 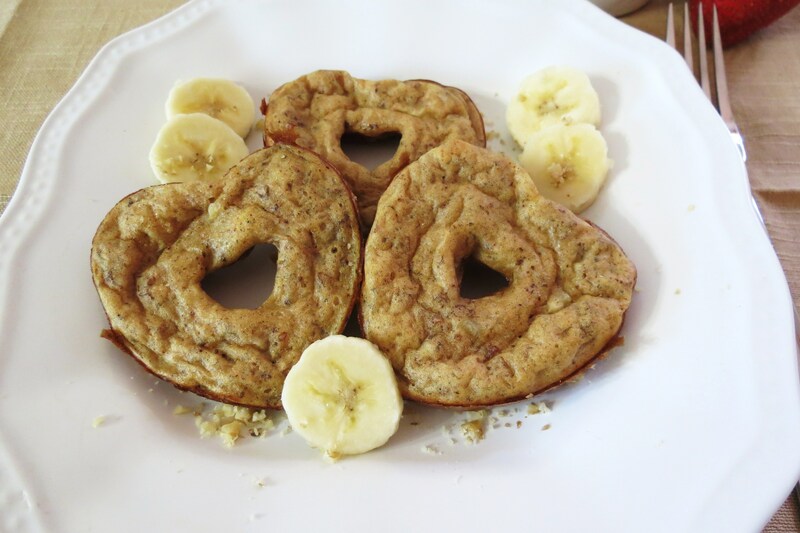 They tasted just like banana bread, even Hubby loved them. 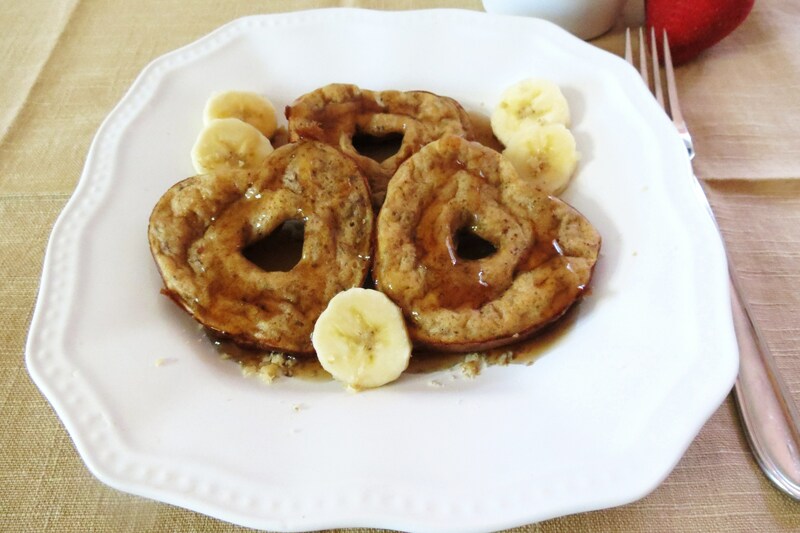 Your probably wondering about the shape of my pancakes, well I made them in a donut pan. Yup a donut pan! Talk about easy! They were the quickest batch of pancakes I ever made and no mess. I got this idea from the Spiffy Cookie. Erin posted pancakes in a donut pan a while back and I had that idea in the back of my mind since then. I just wasn’t sure if my yogurt pancakes would work with it. Well it worked as you can see. These pancakes turned out light, fluffy and perfect!!! Dam you Spiffy Cookie, Dam you! Now I’m thinking I may make pancakes like this always. It was so wonderful to have all the pancakes done at the same time and they are nice and warm. 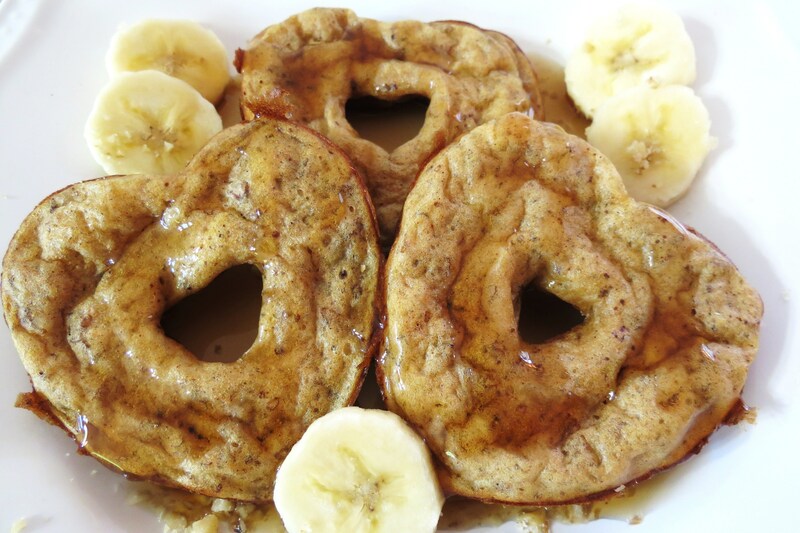 If you have a donut pan, try your pancakes with them. If you don’t have a donut pan you can still make the recipe like normal pancakes, but I do recommend getting a pan because it’s fun! Don’t you think they would be cute to serve for Mother’s Day? Or to show some one you love them? I bought my pan from Target for $9.99. I made these pancakes with banana, walnuts, greek yogurt and pastry flour. I know I said it before but dam did they taste like banana bread. I am so happy with them. I can see these will make a rotation in my breakfast’s. This batch made 8 hearty pancakes and filled me up for a few hours. There a healthy pancake! You have good carbs from the banana and whole wheat, good fat from the walnuts and protein from the egg whites and yogurt. Talk about an all around healthy pancake. It can’t get better than this. Do you like my new plate? It was one that I picked up from Homegoods on Saturday. It was on their Clarence rack for $2.00. I wish I got a couple more, maybe I’ll just have to take a trip there this week and cross my fingers that they still have more. I love Homegoods, it’s so fun in there and you find so many odds and ends and you can’t beat the prices. Combine and whisk till evenly mixed. Fold in walnuts. Spoon the batter into prepared donut pan, filling about ⅔'s full. I want to congratulate Brittany from Delights and Delectables for winning the Trader Joe’s Gift Card and Cookie Butter. I will put it in the mail today! A special thank you to Erin from Spiffy Cookie for showing me a new way to make pancakes! You changed my pancake world! I can’t wait to see what I will create next! Also great job on raising money for the House of Mews. I made your friends banana bread and am throwing in a special treat, I will put it in the mail today. With all that said, I am going to wrap up all the goodies and get that ready for shipping, plus I need to make dinner. Think I’ll make my Caprese Pesto Panini again. It was so good. It was all I thought about today! 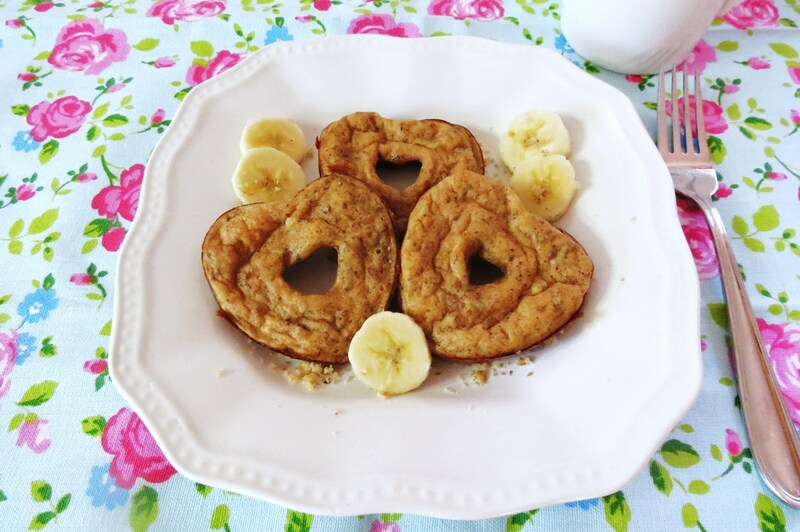 I LOVE pancakes for breakfast but rarely make them because they’re such a calorie bomb! Not these babies. And they have banana…which I LOVE. Yay I am so glad you liked this new method of cooking pancakes that I discovered! I will have to try this recipe. 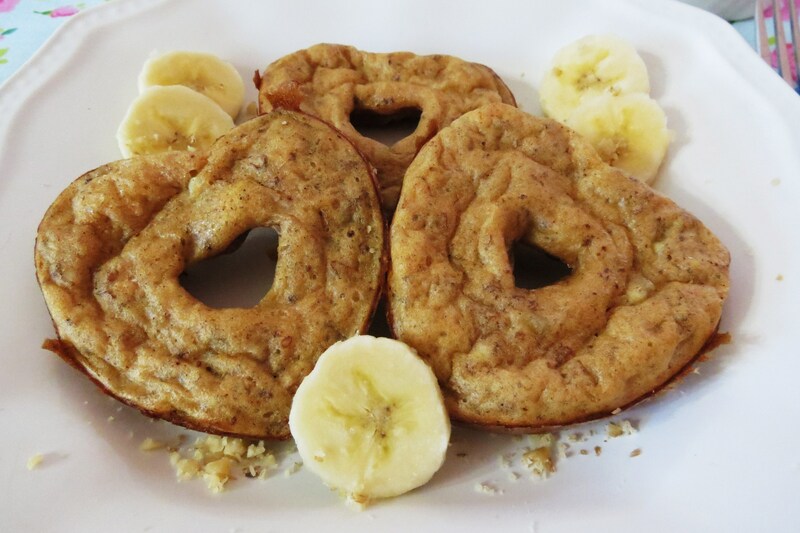 Banana Nut pancakes are a favorite around here. My recipe is so decadent though. We are on the weightloss/healthy eating wagon now (week 1 I lost 5% of my body weight, I am sooooo excited). This looks like a fantastic breakfast to put in the meal plan. We do not have a donut pan, but I am looking to find one now. Oh, and your plate is lovely! Homegood, huh? May have to go take a look! Wow! Congrats on losing 5% body weight, thats awesome!!! You go Girl!!! How are you doing it? You can make the same recipe, like normal pancakes, just use a scant 1/4 cup batter onto your griddle. Besides being delicious, these are so darn cute!!!! Love this idea, Jen! Thanks Liz. I can’t believe they worked with my traditional pancake recipe. So much easier, quicker and no mess making them!! just found your blog and it is making my mouth water! These look amazing – can’t wait to try them out. Thanks for sharing. he he Thank you! Glad you found, please come back anytime!!! I Heidi, If you make them, you have to let me know what you think! Have a great night!! Oooohh man I love this! They are so cute. I’m gonna make them as soon as I’m done w my vegan challenge. If you make them let me know what you think. How are you liking the Vegan challenge. I’m not a vegan, but I honestly think I could be! I just love off the variations of meat replacements in a meal. Seriously, these looks so good. I love the shape…daaaaahling! Thanks! I love the shape too! I thought they were simply adorable! Where has the heart-shaped donut pan been all of my life??? And where have these pancakes been? Someone has been holding out on me! You have to love the heart shape donut pan. I rarely ever use it and it’s so cute!! I’m such a sucker for new kitchen pans gadgets and more. If you eventually want to buy a pan, get a 20% off coupon from Bed Bath & Beyond, than the pan will only be about $8.00. 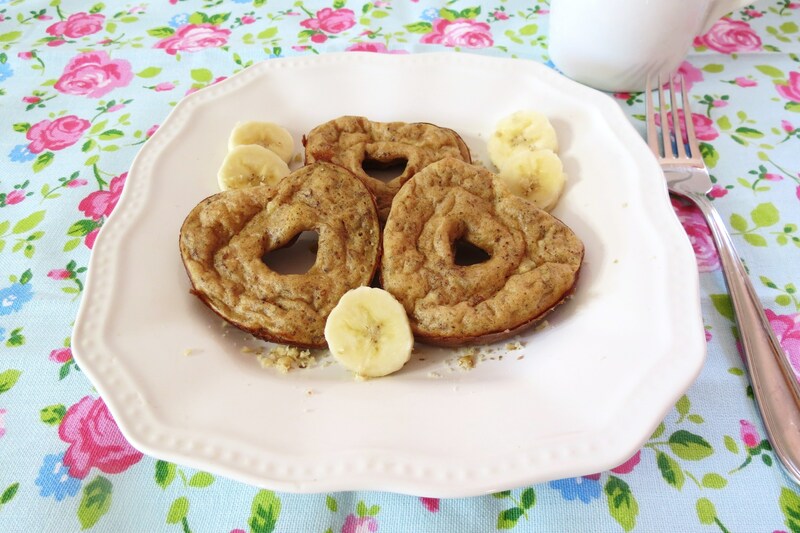 I love banana bread and I love the heart shaped pancakes! I love he idea of a baked pancake! This is so awesome. And all the protein – would be a fantastic post-workout treat. 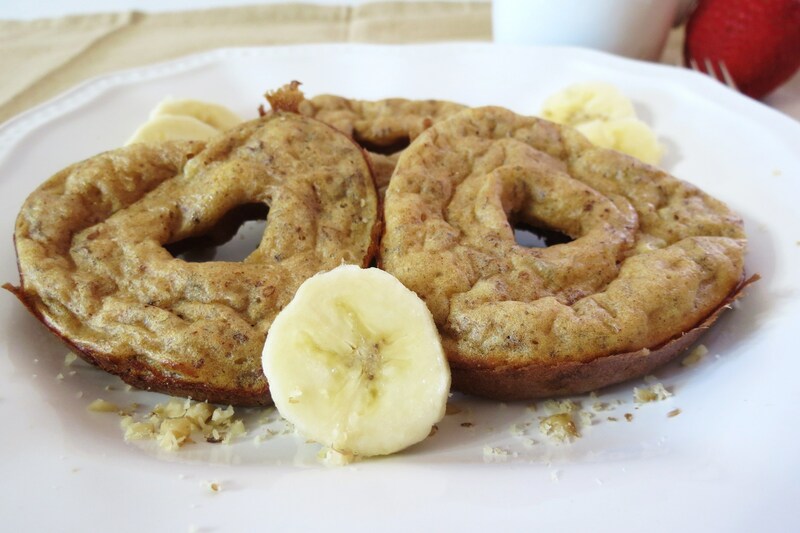 I never thought to make pancakes in a doughnut pan before…such a good idea! Wishing you more of those sunshine feel good mornings this week 🙂 They are the best! I love Home Goods and I love the idea of making pancakes in a pan in the oven. So much less mess and fuss. And healthy, too? Fantastic! Yum, honey on top would be fantastic!! Just tried these but subbed unsweetened cocoa for the cinnamon added a little milk, just wanted some chocolate. I cooked them in a waffle stick maker. Ummm delicious. I will be checking out your site often.